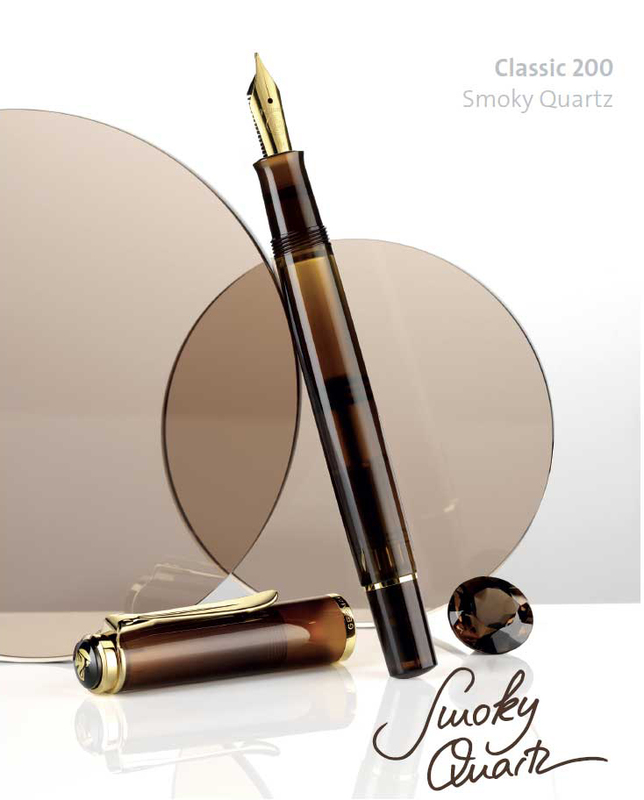 This M200 will be a demonstrator in the hue of Smoky Quartz corresponding to this year’s Edelstein limited edition ink. The M200 line has not seen a new edition since the very limited edition (just 100 pieces) M201 Mars Red from August 2015. This will be the third special edition model that takes on the hue of one of Pelikan’s inks and I’m really enjoying the trend. I’m already anticipating what the next release may look like which is promised to be an olive-green hue planned for 2018. The M200 is part of Pelikan’s Classic Series, an upscale, entry-level line of pens. The line is characterized by gold-plated furniture with styling which features a printed one chick logo cap top with a gold-plated crown, a single cap band, a single trim ring at the piston knob, and the traditional pelican’s beak clip. The pen will be equipped with a gold-plated stainless steel nib in the standard sizes of EF, F, M, and B. Since the pen is a demonstrator, the piston mechanism and ink reservoir will be visible for your viewing pleasure. The M20o Smoky Quartz will be a special edition release with a finite production run though pens usually remain available for sale even after production ends. It will be available as a stand alone pen or as a set that includes a bottle of Edelstein Smoky Quartz ink. 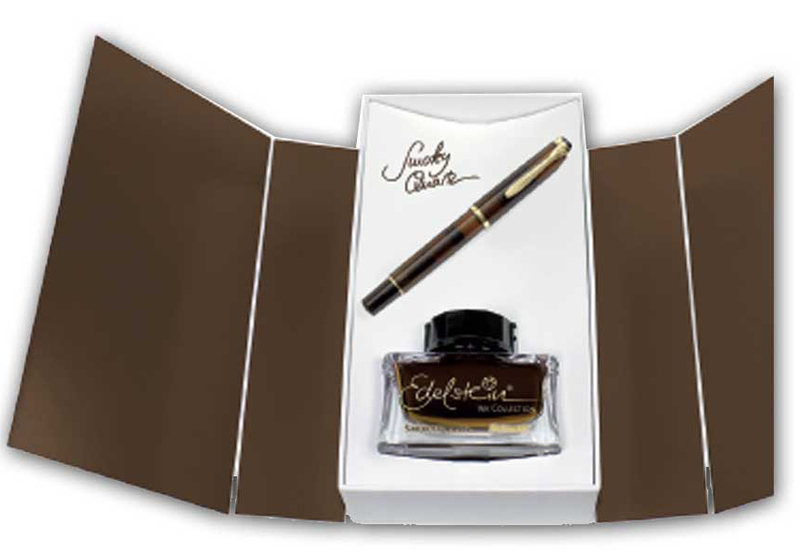 If you purchase the set, the Edelstein ink bottle will feature gold lettering, a unique feature available only with inks purchased as part of the set. A complimentary K200 ballpoint pen will also be available. Retail pricing is likely to vary but Fritz-Schimpf is asking €100 (~$111.83) for the fountain pen, €116 (~$129.72) for the set, and €92 (~$102.88) for the ballpoint pen. I like the look of this M200 a lot but have learned to temper expectations until seeing the pen in the wild as pre-release product shots can be deceptive. Seeing the color of the cap and barrel realized, I think that it was a smart design decision to trim the pen in gold rather than chromium as we’ve come to expect. I like the shade though the product photos remind of darker versions of the previously released Amber (2003) and Cognac (2014). Hopefully the real world manifestation will be able to distinguish itself (it looks up to the challenge). It goes to show that Pelikan considers every release individually in an effort to craft the best pen possible. What are your thoughts? Will you be picking one of these up or have you had enough with the array of browns recently released from Hannover? I will almost certainly be getting one of these fountain pens. Just pre-ordered mine from Fritz Shimpf, took a while because my German leaves a little to be desired! Roll on August, hopefully I’ll have it in time for the Hub this year. Congrats! The website is in German but those working there speak excellent English should you have any issues or questions. On the plus side, going with gold furniture was a no brainer, silver toned furniture would been a fashion fumble. As brown pens go I think it is a nice looking pen, but you hit the nail on the head: how many brown pens is the right number? I am surprised that there was not a little more creativity, or ‘edge’ to the release. Their choices around the color wheel seem to have left a glaring omission to my thinking: Yellow. They have done the blues, the greens, and much of the red/violet range (maybe room for a translucent orange). It’s a nice enough little pen but I’ll pass on this one. I wouldn’t mind to see a bit more love for yellow. The Citroenpers is one of my favorites. I think conservative German sensibilities keep some of the more intriguing colors from getting incorporated into their pens. Most of the really exciting colors that have come out over the years have been destined for foreign markets. Simpatica esta caneta, mas para mim não será opção. I really need to see it in person before i’ll buy, to understand how different it is from the Cognac.. I think there is enough here to distinguish it fro the Cognac which has more amber tones but I agree, the proof will be seeing it in person. It certainly looks very appealing in the product photos (don’t they always!). I agree, that the gold coloured furniture is a pleasing match for this brown pen. It will be lovely used in combination with the matching Smoky Quartz ink. I have only tried Tanzanite from the Edelstein range so far and whilst I liked the colour very much I found that it bled more than most and so I have tended to avoid using it. Not tried Smoky Quartz yet. I have not had that experience but so much depends on nib and paper as well. There are a lot of combinations out there. I enjoy smoky quartz. If you like browns, its work picking up a bottle before they are gone. Yes, you are right about finding suitable combinations of nib, ink and paper, which is one of the joys of this hobby. If any particular nib, ink or paper has issues, the answer is not to avoid it but to work to find a combination that helps. A good lesson which applies to much in life. Good deal. That’s the very reason I could never be a retailer. Far too tempting to purchase everything that comes along. i can’t wait to get my hands on the smoky quartz. counting the days ’till the pelikan hub. The Smoky Quartz looks nice and I can’t wait to see one in person. The Hubs event will be here before you know it.